This Spring I shared with the world why I got rid of my wardrobe. But long before I tackled my closet, I decided to get rid of the toys. I vowed there would be no more stepping on Legos in the middle of the night and tripping over blocks. Too many toys are a safety hazard and a sanity hazard. I have to argue that any child would be completely overwhelmed with a selection of toys as lengthy as the Cheesecake Factory Menu. Just like I felt about my overwhelming wardrobe, I believe maintaining a short “fine-dining” menu of higher quality, carefully chosen toys is a better fit for children. So I knew what I didn’t want: toy chaos. What I did want was a tranquil space for my son to play independently. After all, we know kids learn through play. So I pictured his playroom to be like his office. The place were the real work (a.k.a playing) gets done. We started to learn about a child’s “work” when we enrolled our toddler son in a playgroup in our neighborhood. It was at a Montessori school–which we didn’t know a thing about. The first week, my husband, Mr. B. took him to the group. Mr. B. came back from the group with an excited but confused mix of feelings. He explained to me that the classroom felt empty–maybe even a little boring. Mr. B. told me everything in the classroom had its place. Each toy in the classroom had its own little basket and a special spot on the shelf. And the rule was that each child should only play with one toy at a time, and put it away when they are done. Groundbreaking, right? What’s more, he said that all of the kids were completely engaged in the few toys the room had to offer. There was no mischief-making…no one trying to unload the teacher’s cupboards, bite their friends, or run out of the room. I was intrigued. 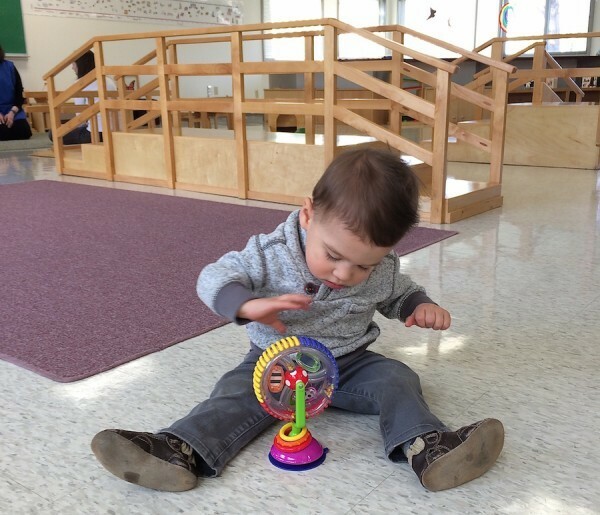 A throwback to our little guy completely engaged in a single toy in his school playgroup. The following week I observed it myself for the first time. After my first observation, I was sure that the school was lacing the Kool-Aid with a special rule-following medication. Either that or it was a cult. I couldn’t get over how well the children played independently. They were completely absorbed and occupied in their tasks at hand. I was determined to figure out what the secret was so I could jump on the bandwagon and bring it home. The things we surround ourselves with are not always lovely, not always useful or meaningful. In our house, we have closets and a garage full of things we don’t really need or use. We have living spaces that are cluttered with toys, books, games, art projects and the like. Often these things have missing or broken pieces…What I will do is be more deliberate about what we really need, what is truly engaging, and what is lovely and pleasing to us. I intend to be more thoughtful in how these things are arranged, displayed and organized. Nothing is stacked or hidden, nothing is in a toy box or in cluttered bins. 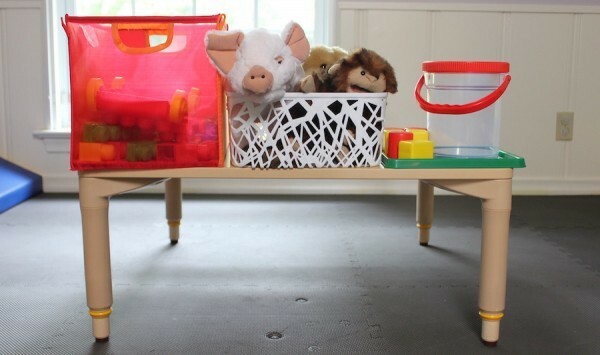 The children can see the materials, can access them easily, and can put them away with ease. And with that quote, I was sold. Hook, line, and sinker. This is how the playroom looks today. It is a work in progress and it is constantly changing and developing along with our son. 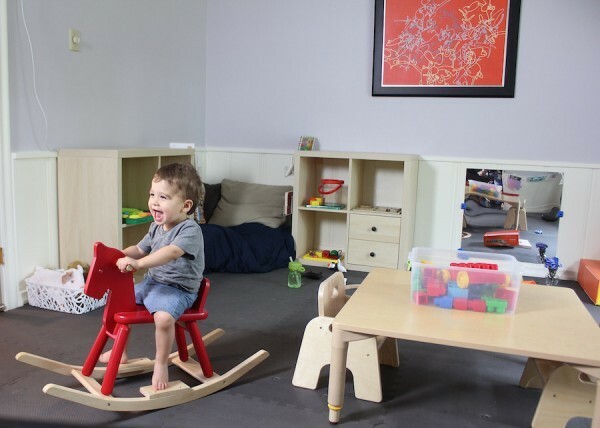 We created our son’s office playroom in a way that we hope he will be learning and playing in for years to come. Is it extreme? Yes, absolutely. But we have already seen how wonderful it has been for his play, development, and sanity (heck, mostly our sanity). Here’s how we did it. 1. We started with a completely bare space. 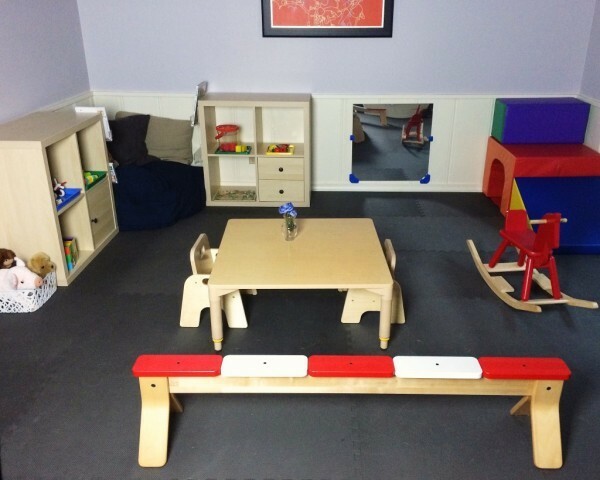 Starting with an empty play room allowed us to add each item in one-by-one with careful consideration. 2. We got the right organizers. 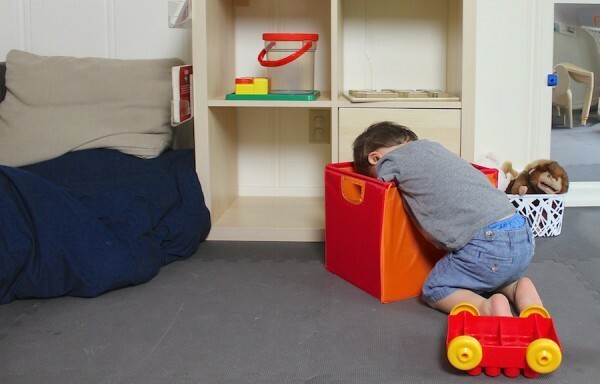 Toy boxes and large bins are a bottomless pit that invite dumping. Instead, we have trays and short (6 inches) containers that can easily be accessed without mess making. These types of storage containers ensure that the items are easy to see, easy to access, and contained. Exhibit A: Tall, large bins invite digging and dumping. What’s down in there anyways? We prefer to use trays and 6-inch tall, easy to see through, storage containers. He can easily see what is available, get to it quickly, and put it away with ease. If you must use tall bins (like the red), we prefer the Ikea type with a sheer-front for visibility. 3. We found a toy-style. Just like people have different clothing styles, there are also different toy styles. This grandma’s toy-style really stuck with me. Several years ago, I was trying to find a hobbyhorse, the kind that has a horse’s head on a stick, for my youngest granddaughter who had fallen in love with all things horsey. Much to my surprise, I could never find one that didn’t make all sorts of horse sounds and play cowboy songs — we quickly removed the batteries. A silent horse allowed her to create her own sounds and stories. 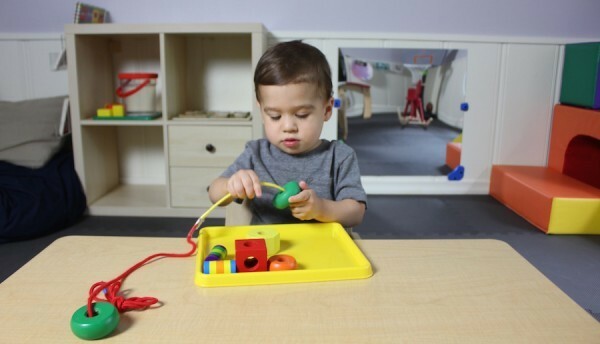 Our toy-style includes mostly toys that are task-based (a shape sorter, a puzzle—generally toys that you can “complete” or master). We also try to incorporate many open-ended toys, much like the silent horse. Although it may be controversial, we request “no gifts” at birthday parties. Our close family and friends spend time with him and are familiar with our toy-style. They tend to purchase great additions to his space. If we do receive a gift thats not “our style”, we try to repurpose it or donate it to a good cause. If someone gifted me some jeans that were clearly too small or weren’t my style, it is unlikely to would wear them. I don’t think the use of toys should be much different. 4. We changed how we buy toys. Rather than sticking to the birthdays and holidays to buy toys, I buy them year around. We have a “one-in-one out” policy, with 15 toys and 8 books in the playroom at any given time–and small bins for books in other rooms in the house as well. I buy toys used as much as possible. And when he outgrows them, I put them into storage for our future children. I don’t get sucked in to things that “look super fun”. I buy toys all year to meet his developmental needs and interests-which are always changing. Once he masters the chunky shape puzzles, it’s time to move onto the jigsaw. Keeping the toys appropriate for his current age keeps him engaged. If the room was filled with toys that were too baby-ish or too mature, he would either ignore them or play with them inappropriately. 5. We keep variety. 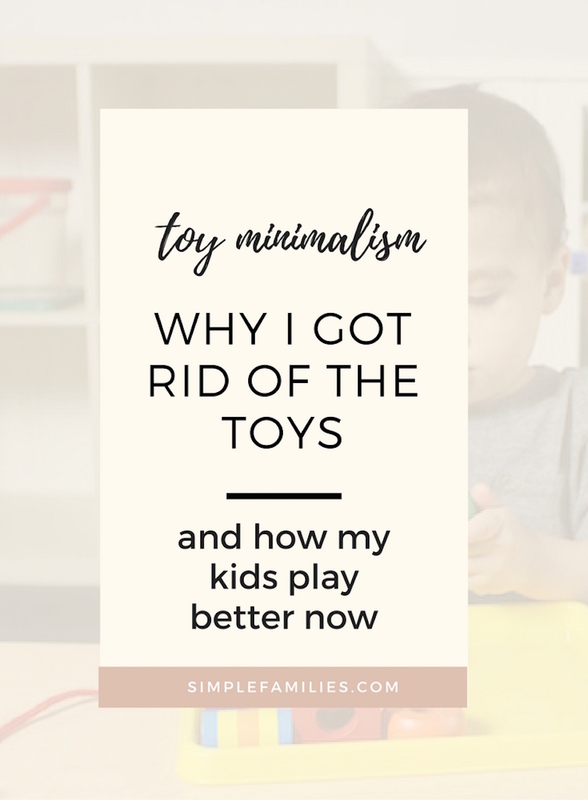 I always make sure to keep at least one of each of following types of toys: Gross motor, fine motor, plush, stacking, building, connecting, puzzles, pretend play, musical play, art play, and of course books–the books are rotated regularly. 6. We keep it minimal. I rarely put out an entire set of anything. Does he really need access to all 300 Mega Blocks that came in the set? No. Usually 50 will do the job. And he only needs one Thomas the Tank Engine. He does not need Birthday Thomas, Musical Thomas, Light-up Thomas, AND Halloween Thomas. Setting boundaries helps to free up space in the room and makes for easy clean up. Speaking of clean up…it’s so easy. If I do it myself after bedtime it takes me 1 minute and 20 seconds (yes, I timed it) to put everything back in perfect working order. If our son helps, it obviously takes a bit longer. It’s not always clean. And he doesn’t always (or even usually) put away the toys as he plays. But I feel good about where we are at right now. I don’t want to spend the next decade yelling at my kids to clean up their toys. If the toys are manageable they will not only be easier to clean up, but easier to get out and enjoy. And he does enjoy them. Our son is an incredibly happy, busy little man. I feel confident that these toys provide him with a lot of fun and numerous opportunities of exploration and creativity. Denaye originally published this post on the Dallas Moms Blog.